Mount Diablo stands tall over the the Central Valley of California. Not only can it be seen from my job site in San Francisco and from along the Sacramento River, but it has one of the largest viewsheds in the world, second only to Mount Kilimanjaro. On a clear day the views stretch all the way from Mount Shasta to Yosemite Valley. Unfortunately, this wasn't one of those days. Over the golden Tower Bridge and past Raley Field, I continue down the busy Jefferson Boulevard for a short stint before turning off on the Cortland Branch Line Trail. Miles of gravel flow through watermelon and pumpkin farms, past a high school football stadium, and end up under a wooden bridge a short ways away from the Sacramento River. Starting off on the Cortland Branch Line Trail. The Delta is busy with recreational boaters and fisherman looking to bring home some striped bass or salmon for dinner. I continue past the Freeport Bridge, my normal crossing point for a morning river ride, and go on to pass the Paintersville Bridge also. The Sacramento River is used for some hefty shipping, so all crossings are draw bridges of different designs. County Road E9 runs over Steamboat Slough Bridge and I take the right turn to Grand Island Road. Country signs at the Freeport Bridge. I didn't even know I took this shot until uploading photos after the trip. Farmland appears on the west side of the road and the river hugs the narrow road on the east. The actual riding surface isn't as nice here, but the difference in scenery is a fair trade. Cal Trans operates two ferries along The Delta, the J-Mack Ferry and The Real McCoy II (the original McCoy was getting too old and weak to cross the river without getting pulled away in the current). One car joined me just before taking off on the first ferry crossing. Waiting for the cable-driven ferry to dock. All aboard - not much car traffic at this time. Just as I wonder when a safe spot to pull off the road will appear I notice a small farm stand tucked away under a tree. For two dollars I grab a plate of peaches to snack on later and take time to make a couple PB&Js, a bike touring staple. Just as I arrive at the next ferry crossing and begin to take the flat ground for granted Mount Diablo appears in the distance - reminding me that tomorrow won't be so easy. At the request of the ferry captain I board last to avoid getting run over by the rushing cars at the other end of the river. These ferries operate 24/7/365, other than for two twenty minute breaks during the way, talk about a repetitive job. Mount Diablo with the Rio Vista Bridge in the foreground. Still riding south along the Sacramento River, I cross over the Rio Vista bridge and continue on CA 160 straight to Brannan Island. This segment has the most amount of car traffic and inconveniently placed rumble strips on the shoulder, making for some rough sections of road. All the way Mount Diablo is looming in the distance. Plenty of daylight remains, but I still decide to stop for the night at Brannan Island and stick to my original plans. For a mere four dollars I score a walk-in camp site along the water surrounded by a few other vacant sites. I wait for it to get a little dark, cook up come turkey chili and spaghetti, set up camp, and pass out for the night. I got a solid 12-hour night sleep and woke up in a hurry to get back on the road. Views from CA 160 to Brannan Island. Views down the river to Diablo from the camp site. Sleeping arrangements for the night. The wind turbines are spinning in the Delta breeze, not only providing power to the grid but also giving me a steady headwind to battle. Another river crossing is in view, this time over the Antioch Bridge. There isn't a sidewalk, but the traffic is fairly light and the shoulder size is decent. The bridge is as straight as an arrow for it's entire two mile span and I am plenty visible. At the crest I take a moment to stop and take in the views from an elevation of 165 feet. Large cargo ship heading out to the SF Bay. Taking the first exit off of the bridge drops me off on side streets to Pittsburgh-Antioch Highway, finally leading to a gravel bike path. Gravel turns to pavement and the trail ends up paralleling CA 4, The Delta Highway, before running along a calm canal. The Contra Costa Canal Trail merges back and forth with the Ygnacio Canal Trail, eventually dropping off in a nice neighborhood a few blocks away from North Gate Road, which leads all the way to the summit of Mount Diablo. I thought I made a wrong turn and hit a dead end until this tunnel appeared. Here we go. I get weird looks from all the people on lightweight road bikes passing by me. They ask if I plan on going all of the way up. That I do. Starting off at the "entrance" to Mount Diablo. The climb is constant and unforgiving, rising from sea level to just about 4,000 feet in ~13 miles. Toward the end it was tough to make pedal rotations and keep any momentum, especially when going off the side of the pavement a few times and needing to mentally reset to continue. The occasional "right on" from people descending and encouragement from and conversation with people passing me on the way up make me continue on. Three and a half hours later I make it to the top. Totally beat and looking forward to the downhill ride back to the base. One last view before turning back. It is nearly 4 PM and the next train arrives at Martinez in 15 minutes. There is no way to make it, looks like the 5:15 train will have to do. Booting up Google Maps on my phone quick to double check directions to the station I notice that it is 12 miles away. With 115 miles on the odometer and lots of climbing under my belt I decide to push hard and battle the clock to Martinez. I make it to the ticket counter out of breath with 6 minutes to spare. Riding the Contra Costa Canal trail to Martinez. Taking the easy way back. 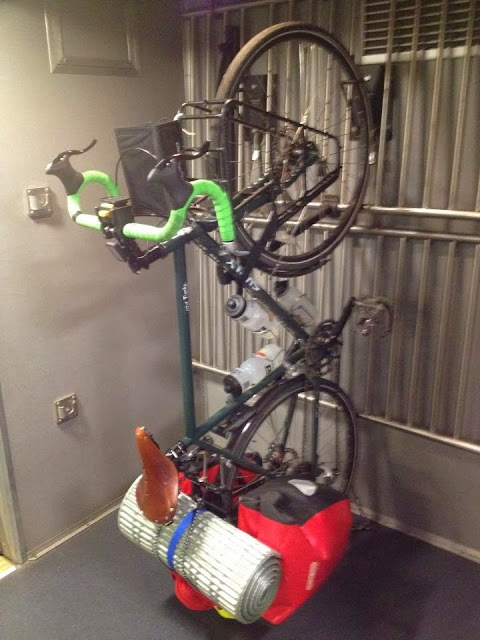 What a relief it was to take off the front panniers and hang my bike up on Amtrak. I secure a seat within view of the bike and enjoy the quick ride back to Sacramento, well worth the $19. This was somewhat of a Reverse-Rinko trip. "Rinko" is a Japanese term for travelling on train in order to reach a cycling destination. I see many more Amtrak/bike trips in the future once my Brompton comes in!